A work station is much like a human mind. It’s often full of tools for a craft, contains multiple ways to communicate internally and externally, and, if cluttered, can really slow the work process. A’s Ticket Services Representative John Austin has found fascination with the desk of fellow Rep, Andrew Bleaken. 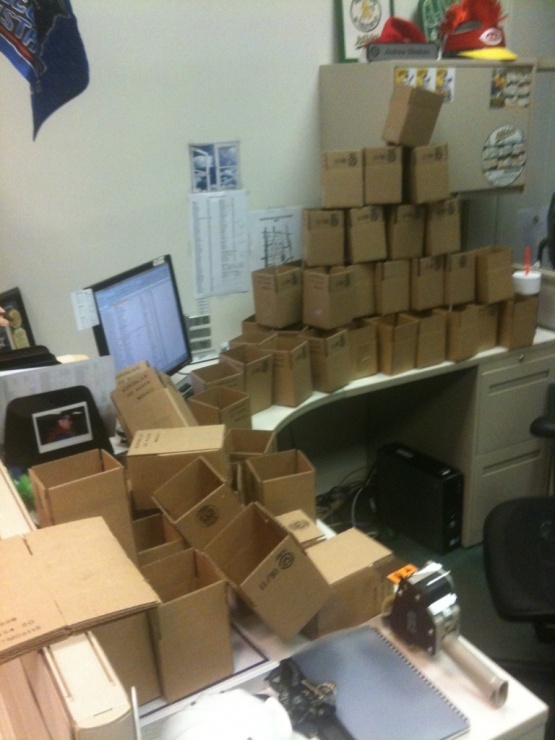 John regularly documents Andrew’s desk in the hilarious blog “What’s On Andrew’s Desk?,” where an intrigued reader can see an amazing assortment of wayward autographed baseballs, be reminded to download their own Drexel men’s basketball schedule, and learn how many mini cardboard boxes can fit on Andrew’s desk. Read and follow What’s On Andrew’s Desk? JibJab and Major League Baseball have teamed up to create an animated video for “Take Me Out To The Ball Game.” Teams were approached months ago about the concept and were able to provide feedback. The final result turned out great. You should know that the A’s really pushed for white cleats in our video. Don’t let the black shoes dampen your viewing experience. First check out our Ticket Services video, featuring Andrew, Catherine, John, Josh, and Lauren. Then create a video of your own with your friends, family, and co-workers. You can even post your link in the comments section below. We promise to watch it. Miss us? Yeah, we’ve been quiet for a little while. Maybe you thought we took the offseason to lay on a beach in the southern hemisphere. We wish. Many fans often ask what we do during the offseason, assuming we take some time off or work a second job. Nah, we’re full time, year round – and the offseason is when it gets busy! Seriously. The regular season runs so smoothly for us all because of the time we put in during these winter months. Like any event, the setup is the hard part. You ace a test by studying, not sitting down day of and taking it. Two major projects have engulfed us this offseason. First, we upgraded our ticket interface. Initially, you won’t notice a different when purchasing tickets online or over the phone. Eventually you’ll find advanced improvements to the single game ticket purchase flow. Internally, we’re experiencing a complete change. Our updated Tickets.com web-based software is shiny and new with all sorts of bells and whistles. It’s an adjustment period from our previous system, but it’s great to advance forward. The second project is the 2011 E-Brochure. We live in the geographical capital of online communication. It’s only natural that we steer away from the printed brochure and move toward majority online communications. Working with Channel 1 Media, an industry leader in online professional sports brochures, we created what we hope is an informative and fun e-brochure where A’s Season Ticket Holders can obtain renewal information and all fans can learn about the schedule, ticket/suite/premium seating options, and promotional item information. Members of the A’s Ticket Operations staff, MLB.com, and Channel 1 Media put a lot of time and effort into the piece. We think it turned out great. You can find a version of it at oaklandathletics.com/2011. If you’re a Season Ticket Holder you’ve already received your email with a personalized URL (and a one page postal mailing directing you of the same web address). We’d love to know what you think of the e-brochure. Feel free to post a comment. As always, whether it’s the offseason or the middle of a 10 game homestand, we’re here to help you. A’s Ticket Services staff can be reached at (510) 568-5600 or at tickets@oaklandathletics.com. Drop us a line if it moves you. Halloween is one of our favorite holidays here in the Ticket Services office. Between all the candy, great costumes, candy, and the tricks (did I mention candy?) it’s hard to not have a fun time. The holiday spirit prompted your esteemed service representatives to hit the music studio to film what we hope to be the next Billboard #1 smash hit. Check it out and tell us what you think! Jam to the song and video while you carefully carve Spooky Pumpkin Stencils with an A’s theme (kids ask your parents first). Also, don’t forget that with Halloween comes that time of year to renew your season tickets! 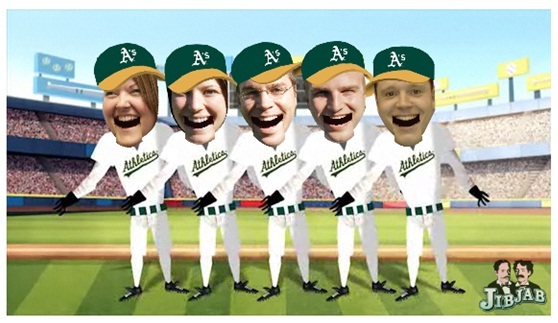 Keep a close eye on your email inbox and postal mail in the coming weeks for the 411 on your 2011 A’s Season Tickets! Special thanks to JibJab.com for the music and video. We want to give a HUGE thank you to all A’s Season Ticket Holders that attended the private party on Saturday, September 11. The special event, strictly for Season Ticket Holders, welcomed guests with a red carpet entrance to the Eastside Club. Once inside, children had an area for coloring, complete with face painting and balloon art. Adults had a DJ for dancing and karaoke. Everyone was able to dine on complimentary food. Legendary A’s pitchers Vida Blue and Dave Stewart posed for photos with fans at the World Series trophies for nearly an hour. Ray Fosse lead Question and Answer sessions with Andrew Bailey, Craig Breslow, Trevor Cahill, Gio Gonzalez, as well as with Blue and Stewart. Even Executive Director of Ticket Sales and Operations, Steve Fanelli, and In-Game Host Kara Tsuboi graced the stage to thank the guests. Did you smile big for your photo when entering the Eastside Club? These photos will be on your 2011 Opening Night ticket! How cool is that?! You’ll have to renew your plan in time for the commemorative ticket stock. Get a jump on next season by calling the A’s Ticket Services Office at (510) 568-5600. You can even request seat relocation now by phone or online here. Thank you all again for what continues to be a fun season of A’s baseball! Trevor Cahill and Andrew Bailey were not the only A’s participating in recent All-Star Festivities. Your favorite Ticket Services Representatives took the field this week in the annual front office softball tournament at the Coliseum. With the sun baring down, John, Lauren, and Andrew took the field with their own teams to determine who is the best softballer in the Ticket Services office. In the first game, Andrew had some early hits turned into runs. By the end of the game, it was Lauren who tied the game with two outs in the bottom of the 7th inning to keep her team’s rally alive, sending Andrew to the bench to await the consolation game. In the consolation game, John and Andrew teed-off against each other. John hit a couple of long balls, but the athleticism of Andrew’s team turned them into fly ball outs in the box score. Unfortunately for Andrew, John’s team kept Andrew off the base path all game. In the end, it was John who won the game, leaving Andrew in last place. For the championship game, Lauren, who already proved her softball skills to the other representatives, took the field. Though her bat and glove shined during the game, Lauren’s team proudly settled for second place. At the end of the day, your favorite Ticket Representatives agree that there was a great time had by all. Speaking of great times, check out the new Summer 6 Pack, 6 tickets in the Value Deck for one low price! The A’s collected the first regular season win of 2010 last night. A 10 inning walk-off single by Mark Ellis lifted the A’s to victory behind a 7 inning, 10 strikeout no decision performance by starting pitcher (and Stockton’s own) Dallas Braden. At 1-1 on the season the A’s are poised to strike at the AL West Division leading Texas Rangers (1-0). OK, yeah, we know it’s early. We also know Season Ticket Holders love to see wins. While the team on the field looks good, so does the team in the Ticket Services Office. You’ll see some new faces in the office should you visit us on game day. Some familiar faces too. Every face with a smile and desire to help you. While we enjoy the face-to-face interaction, we realize you’re at the ballpark to see the baseball game. We want to remind you of the ticket policies and services we have in place to make being an A’s Season Ticket Holder more advantageous than ever. Our Ticket Services webpage (oaklandathletics.com/ticketservices) is a great starting point for all Season Ticket related information. Have a question about when/where/how to exchange one of your Season Tickets for another game? The 2010 Season Ticket Holder Policies will provide an answer. Speaking of exchanging tickets, by now you’ve heard that we are the first Major League Baseball team to offer exchange and credit return of you Season Tickets online. Visit the Ticket Exchange form, but only use if you actually want to exchange or return tickets. Trust us, it works. The always faithful My A’s Tickets allows Season Ticket Holders to transfer tickets to a friend or tolerable in-law. Yep, you can purchase Discount Parking Passes throughout the season. Save your money on most Tuesdays though. Remember, it’s Free Parking Tuesdays in 2010. In addition to the Ticket Services Office we are still available by phone at (510) 568-5600 and email at tickets@oaklandathletics.com. We don’t intend to automate a good handshake. Did you catch last week’s release regarding the 2010 season and ticket sales? You might have noticed a section dedicated to Jumbo Tickets. A’s Jumbo Tickets are game tickets with added-value. Within the barcode of each Plaza Club ticket or Value Deck ticket will be loaded value. These “Jumbo” Tickets can be used throughout the Coliseum for redemption at various concession stands for food and beverages and at merchandise stands for souvenirs. Pretty cool, right? Take a look at the Jumbo Tickets page for more information, including more details on the new Value Deck. Like everything we do, we use technological advancements to make it even more fun to attend A’s baseball. And in doing so we’re all over the map. Literally. As of today the Ticket Services Office that you know and love is not only holding ground on the phones in Oakland, we also at a ticketing conference in Toronto and working on Spring Training at Phoenix Municipal Stadium. Maybe we’ll send you a postcard. You ever look at a date on a calendar and think, “That’s so far away.”? Sometimes it feels like that day will never come. Then – BAM – that date has arrived and all of a sudden have to get your wife a birthday gift. Today might be one of those days. Friday, December 18 – today – is the Early Bird deadline day. We know, it came fast. But by renewing in full today you will receive 2 FREE Field Infield tickets ($70 value). Accounts renewing tickets of at least $1,500 will receive a deeply discounted 18 person luxury suite for only $200 ($1600 value). See complete details about Early Bird Benefits. If you’re not interested in Early Bird benefits, but still want to renew your tickets the A’s now offer an online Payment Plan. You can renew your plan in three installments. Pay one-third today and additional one-third payments of the total will be spread out over the next three months. To pay in full or participate in the payment plan, visit your My A’s Tickets account. Our smiling Ticket Services crew is standing by on phones to help you with your renewal. Don’t leave you or your wife hanging. It was an unseasonably chilly early December evening when A’s Season Ticket Holders mingled with Rajai Davis, Brad Ziegler, and A’s Front Office Staff- including your Ticket Services Staff favorites- at Pyramid Alehouse in Walnut Creek. While it was cold outside, inside the attendees enjoyed dinner, a meet and greet with the players, autograph and photo opportunities, and a question & answer session MC’d by A’s broadcaster Ray Fosse. The Season Ticket Holders, all randomly selected, received party favors: new baseballs perfect for autographs, trading cards, and raffle tickets, where lucky winners received prizes such as game used bats, autographed baseballs, and an authentic Mark Ellis jersey. In the spirit of the season, each attendee brought one new unopened toy to the event as the A’s teamed with California Police Youth Charities in support of their annual toy drive. As the A’s staff, we enjoy opportunities to connect to our loyal fans on a more personal level at events such as these. And we should note, the players were amazing with everyone in attendance, showing full desire to be accommodating and involved. Interested in attending an event such as this in the future? As an A’s Season Ticket Holder today you never know when we may randomly select your account to partake in events such as these. We wish you a very happy and healthy Holiday season!